As typical American Funds fund, this New Perspective fund also has a sales load hence it is a load fund. The front end sales load is 5.75%. The fund’s expense ratio is 0.79% per year. The fund has been managed by Gregg T. Ireland since 1992. The fund total net assets are $46.8 billion. This fund is classified as world stock fund. The American Funds New Perspective R6 fund has the lowest expense ratio with 0.46%. This fund also doesn't have any sales load. The fund’s primary portfolio consists of large growth stocks. 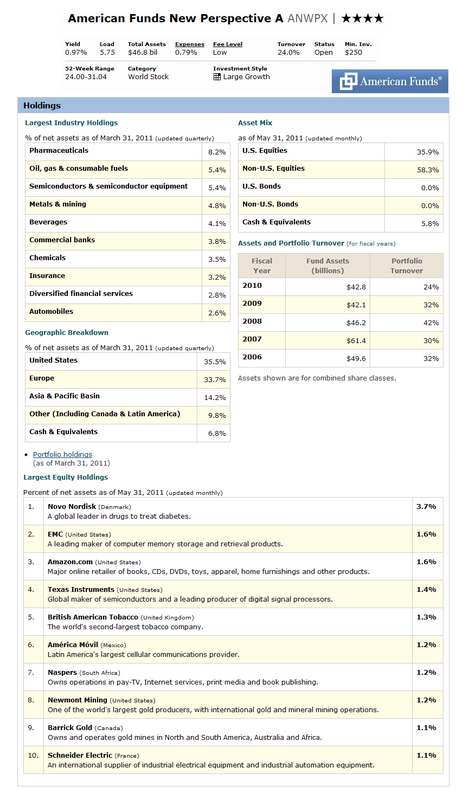 As of April 2011, this fund’s assets are allocated as follow: 58.3% in Non US Equities, 35.9% in U.S. equities, and 5.8% in cash & equivalents. The top 10 largest industry holdings are Pharmaceuticals (8.2%), oil gas & consumable fuels, semiconductors & semiconductor equipment, metal & mining, beverages, commercial banks, chemicals, insurance, diversified financial services, and automobiles (2.6%). The top 10 largest equity holdings for this fund include Novo Nordisk (Denmark), EMC (United States), Amazon.com (United States), Texas Instruments (US), British American Tobacco (United Kingdom), America Movil (Mexico), Naspers (South Africa), Newmont Mining (United States), Barrick Gold (Canada), and Schneider Electric (France).